The Great Egyptian Pyramids of Giza from space and the International Space Station on 10 June 2015. “It took me until my last day in space to get a good picture of these! On his last full day in space aboard the International Space Station (ISS), NASA astronaut Terry Virts at last captured a truly iconic shot of one of the “Seven Wonders of the World” – the Great Pyramids of Giza in Egypt. Virts snapped the exquisitely sharp view of the Egyptian pyramids at Giza on June 10 looking out from the stations windows, just hours before entering the Soyuz return spaceship and closing the hatches behind him for his planned plummet back to Earth. He proudly posted the spectacular photo on his twitter social media account from space while serving as station commander of Expedition 43. The three pyramids of Giza dominate the fantastically beautiful photo. They are located about 9 km (5 mi) from the town of Giza on the Nile, and some 25 km (15 mi) southwest of the Egyptian capital city of Cairo. The Great Sphinx is also located nearby the massive complex of the Great Pyramids and visible in the stunning photo. See map below. 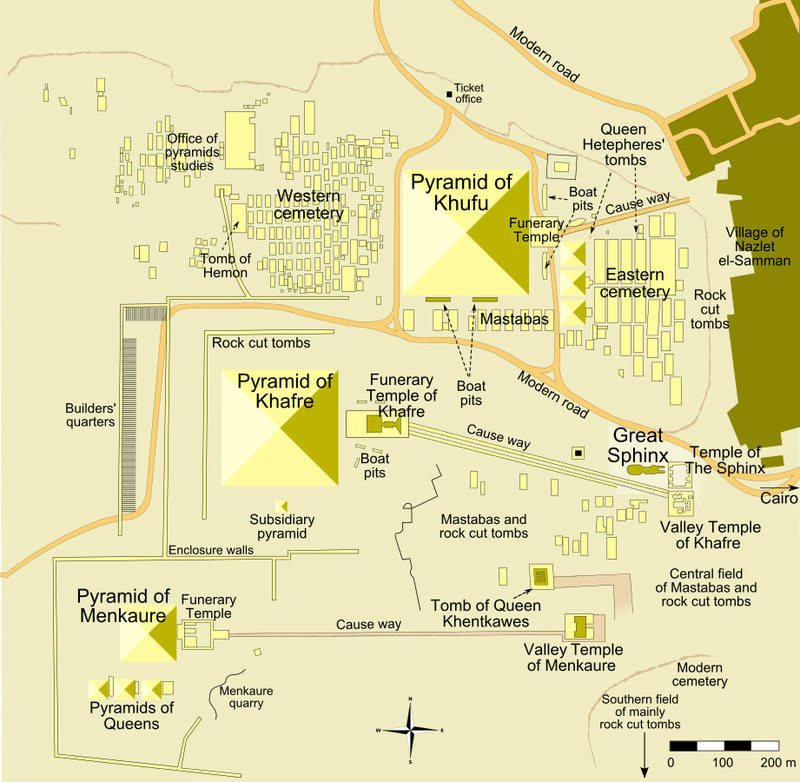 Map of Giza pyramid complex – “Pyramid of Khufu” refers to the Great Pyramid. Virts and his international crewmates from Russia and Italy just returned home safely to a sun drenched and toasty touchdown on the remotes steppes of Kazakhstan on June 11, after departing from the massive orbiting complex aboard their Russian Soyuz TMA-15M ferry craft. Apparently the Pyramid photo proved to be quite elusive – as it took Virts the entire length of his six months duration flight to finally take the stunning close up photo he longed for and achieved, with no time left to spare. “It took me until my last day in space to get a good picture of these!” tweeted Virts from the ISS on June 11. The multinational Expedition 43 trio comprised Commander Terry Virts of NASA, Flight Engineers Anton Shkaplerov of the Russian Federal Space Agency (Roscosmos) and Samantha Cristoforetti of ESA (European Space Agency). They undocked from the orbiting outposts Russian Rassvet module as scheduled in the Soyuz TMA-15M spaceship at 6:20 a.m. EDT, June 11, while soaring some 250 miles (400 kilometers) above Mongolia. Earlier in the mission, Cristoforetti captured a wider angle view of the Great Pyramids of Giza, shown for comparison below. Modern civilization juts up very near to the ancient pyramids. The largest pyramid, known as the Great Pyramid or Pyramid of Khufu was built over around 10 to 20 years and completed around 2560 BC. It measured about 146.5 meters (481) feet in height when it was originally built. At the base it has a width of 230.4 meters (765 feet). Altogether, the Expedition 43 crew served nearly 200 days on board the ISS. During his just concluded stay aboard the ISS during Expedition 43, Virts did three spacewalks totaling 19 hours and 2 minutes. Including the nearly 200 day mission, he raised has total cumulative time in space to 212 days. Virts was a prolific photographer during his duty time in orbit. A few more of his shots are gathered included herein, including one of many nighttime photos, a shot of the Soyuz return vehicle and his very last shot, a magnificent view out the stations windows. The Progress 59 cargo vessel, also known as Progress M-27M, spun wildly out of control as it separated from the Soyuz-2.1A carrier rocket. The freighter and all its 2.5 tons of contents for the crew were destroyed during an uncontrolled plummet as its crashed back to Earth on May 8. As a direct result of the mission extension, Cristoforetti now holds the single mission space record for a female astronaut, of nearly 200 days. On June 6, Cristoforetti surpassed the female astronaut record of 194 days, 18 hours and 2 minutes established by NASA astronaut Sunita Williams on a prior station flight back in 2007. Expedition 43 marked Cristoforetti first foray into space and she is also the first female Italian astronaut. With the departure of the Virts crew, three people remain on board to start Expedition 44. They comprise NASA astronaut Scott Kelly and Russian cosmonauts Mikhail Kornienko, the two members of the first “ISS 1 Year Mission” as well as cosmonaut Gennady Padalka. The next three person crew is due to blastoff in a Soyuz around July 23 to 25 to restote the station to a full complement of six. The next cargo ferry flight involves NASA’s next contracted unmanned Dragon cargo mission by commercial provider SpaceX on the CRS-7 flight. Dragon CRS-7 is now slated for liftoff on June 26. Watch for my onsite reports from KSC.